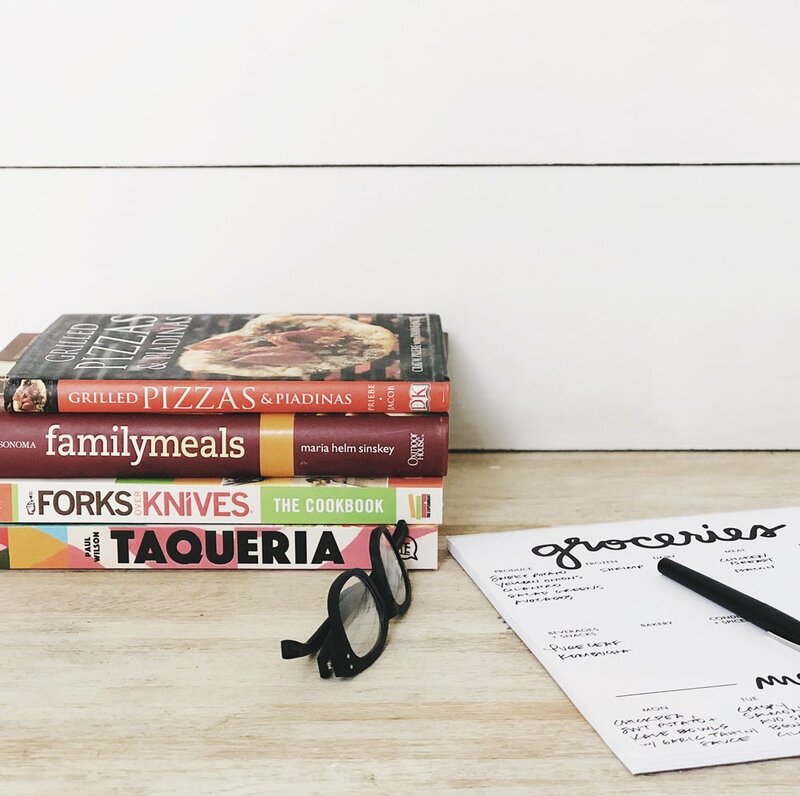 cookbooks...always a good source for inspo. I don't love to keep many on hand (only my favorites!). Don't forget about the library. Meal planning is one of those things that seems simple enough (and truly can be) but actually implementing it can often be a struggle. There are a few tools + tricks that I use to help with the process and I'm passing them on to you so your home-chef-mom-life can be just a wee bit easier. The first rule of thumb is to not attempt to do a full week at a time, starting out. Adding perfectionism to your meal planning can make you give it up for good. Often times if you just aim to have 3 meals planned for the week (and get the groceries in the house for those 3 meals!) your life will be so much easier. Too often, busy families are not all home at the same time and there are weeknight obligations that pull you away from a family meal, so aiming for 3 is a realistic goal. Second rule of thumb is to not try to create 7 new recipes in a week. This is a sure fire way to give up on this whole process real quickly. always have some family favorites in the mix and throw in a new recipe each week, if you're up for it. A tip that I find really beneficial is finding a time weekly to sit down and do your planning and if possible do it while you have a good appetite. That one factor can make this be an almost enjoyable activity rather than a dreaded task. Personally I do this on the weekend and actually look forward to it. Having a hard time coming up with ideas each week? Try themes. For example, Meatless Monday and Taco Tuesday, so you when you're searching for recipes, you have it narrowed down a bit. Actual restaurant menus. While this is a little unconventional, it's a great way to change up your dinner routine. Google your favorite restaurants, pull up their menu and Google the title of the dish. More than likely you'll find plenty of similar recipes available. pinterest boards are a great storage space for those recipes you want to try out on your next menu. Instagram has a feature where you can save + categorize posts...perfect for storing recipe ideas. As mentioned above, having the groceries for the meals is equally important. Nowadays, we are so fortunate to have services like Instacart and AmazonFresh available. Setting these up can take a little legwork, but once you have your regular grocery + household items plugged in, it's basically like magic. Of course it never hurts to have a pretty pad of paper to write your menu on. 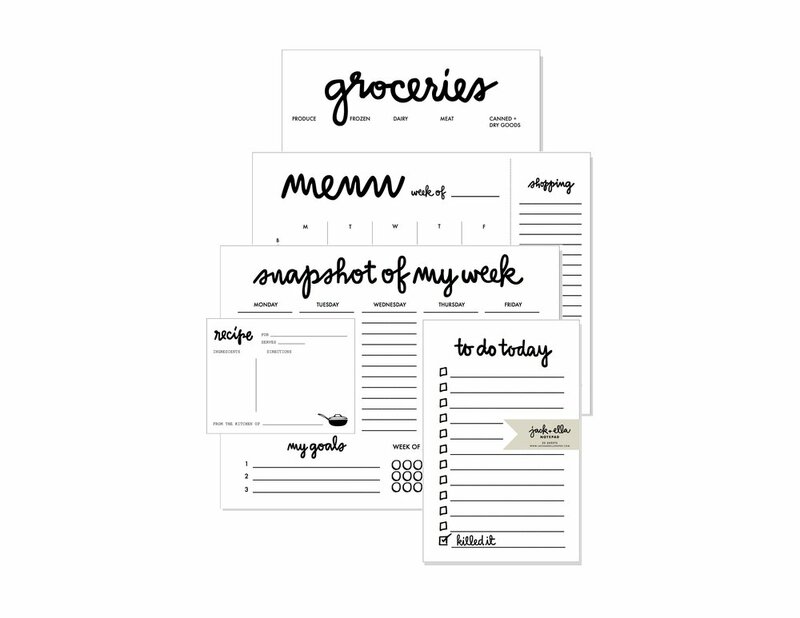 If you like to keep things simple and just plan dinners, the grocery list pad is perfect for that. If you like to plan all.the.meals. the menu planner with tear-off market list will be your go-to. It's been recently updated to all 7 days of the week, per your requests :) Also available are the printable download versions so you can start right now! the motherlode has all the tools you need plus some.